Dixon carried the ball 12 times for 117 yards in Sunday's 26-24 win over the Browns. He added one reception for two yards. Analysis: Dixon also lost a fumble, but it was otherwise a solid showing for the backup. Gus Edwards has clearly become the top rushing option out of the backfield for Baltimore, limiting Dixon's upside on a weekly basis. The latter has been averaging right around 10 touches over the past four weeks, creating some deep-league value (but nothing more) heading into Week 17's matchup with the Browns. Dixon rushed 11 times for 48 yards and brought in his only target for two yards in the Ravens' 20-12 win over the Buccaneers on Sunday. Analysis: Dixon saw a slight increase from the eight carries apiece he logged in the past two games, with Ty Montgomery's inactive status helping him lock in backup duties for the afternoon. Dixon continues to be efficient on a per-touch basis, and his workload could continue its upward trend against the Chargers in a Saturday night Week 16 matchup. Analysis: Dixon has impressed while taking 16 carries for 96 yards and a touchdown and adding two receptions for 27 yards over his first two games back from injured reserve. The second-year back won't have Montgomery to compete with for carries behind Gus Edwards, although Javorius Allen, who hasn't logged any snaps from scrimmage over the last pair of contests, will be in uniform as the presumed No. 3 running back. Coach John Harbaugh said he expects Dixon's role to grow, Jeff Zrebiec of The Athletic reports. Dixon had eight carries for 59 yards and a touchdown with one catch for 21 yards on his lone target in Sunday's 27-24 loss to the Chiefs. Dixon rushed for 37 yards on eight carries and added a six-yard catch in his return from injured-reserve during a 26-16 win over Atlanta. Dixon (knee) is active for Sunday's game against the Falcons, one day after the Ravens activated him from injured reserve, Jamison Hensley of ESPN.com reports. Dixon (knee) was activated off injured reserve Saturday. 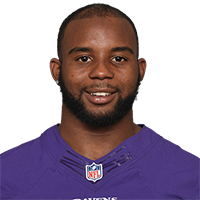 Dixon (knee) could be activated from injured reserve ahead of Sunday's game against the Falcons, Clifton Brown of the Ravens' official site reports. "[Dixon is] real close," coach John Harbaugh said Friday. "I think he's also an option for Sunday. We'll see if he's out there or not. We'd have to make the roster work as well." The Ravens cleared Dixon (knee) to resume practicing Friday. Coach John Harbaugh dropped a hint that Dixon (knee) may be in danger of facing league discipline again, Jeff Zrebiec of The Athletic reports. Analysis: Harbaugh said the Ravens need clearance from the NFL before they can bring Dixon back on the practice field, suggesting there's something at play besides the knee injury that landed the running back on injured reserve after Week 1. Dixon will be eligible to return after a Week 10 bye, but it doesn't seem the Ravens are counting on much -- especially not after they traded for Ty Montgomery.